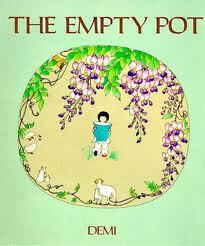 Today’s highlighted book on Asian literature is a picture book, THE EMPTY POT, by Demi. This is a beautifully crafted story about a Chinese emperor who must choose a successor to his throne. He gives every child a seed with the proclamation to plant it. They must return to the Emperor to see who has produced the most beautiful flower. This is a test to see who is worthy to succeed him. Ping is thrilled to complete this task because he loves flowers just as much as the emperor. But when the time has passed and Ping has to stand before the emperor with an empty pot, Ping has to make decision whether to tell the emperor the truth or a lie. What I love about this book: How the message of honesty is woven into the story without sounding preachy. The illustrations are rich and timeless and match the story perfectly. What is unique about this book: I thought the ending was unexpected and satisfying. Why should you read it? This story is set in ancient China. It’s a great way to get exposed to new cultures and new perspectives. This book both looks and sounds beautiful. This sounds like such a lovely book. I think anything based in China has the air of a fairy-tale to it. Love the name of your blog, too!